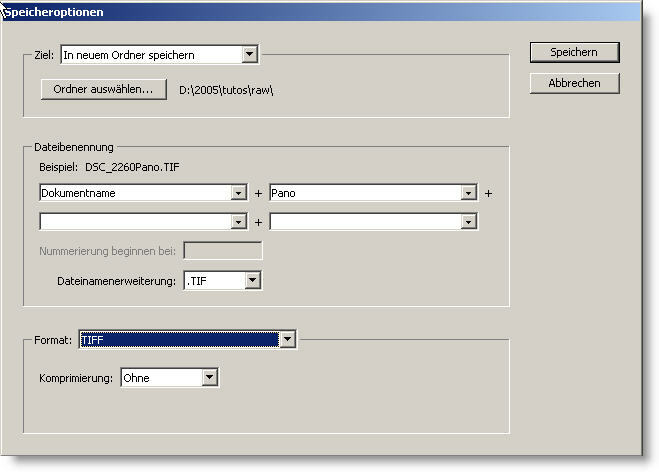 Working within CS2, click File->Open and then navigate to the panorama's source images. 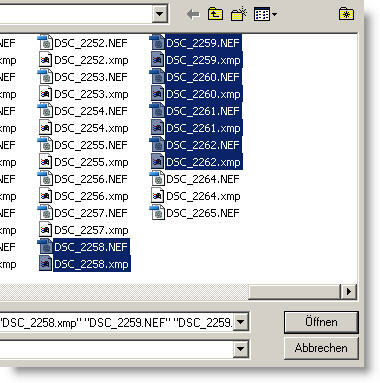 Select the relevant source files and click Open. A window will open with thumbnailed pictures on the left and the selected picture in the middle. 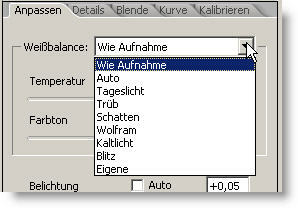 On right hand side are tabs with the images' parameters and adjustment sliders. First check the colour temperature. You should select all pictures on the left side for this action (standard selection commands f.e. 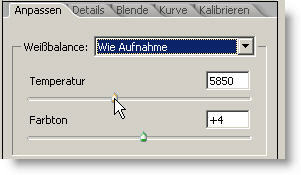 Ctrl+A for all), because the color temperature has to be the same for all pictures of your panorama. After that, check the exposure. CS2 automatically set the exposure tabs on Auto. Search for your key pic in the left row and tab it with the mouse. Uncheck the "Auto" and look at the result. 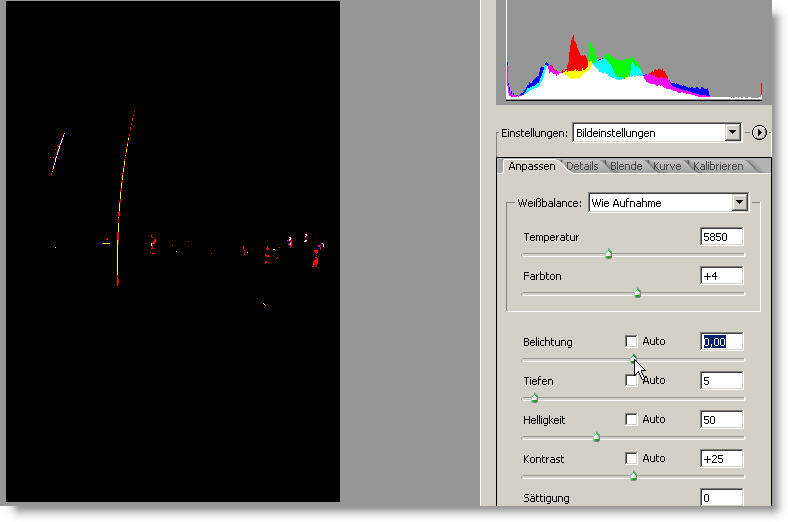 Adjust exposure by moving the exposure slider (Belichtung) on the right site: If you use the Alt key you will see the clipped bright parts on black background, moving the first slider exposure; Same for shadows (Tiefen), you will find the clipped dark parts on white background. 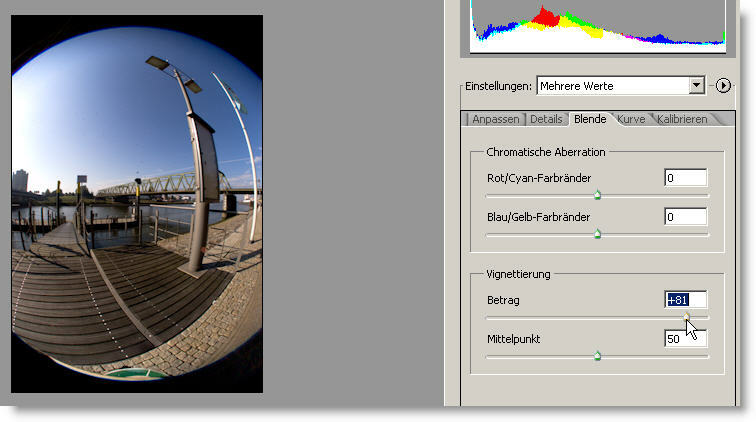 Sharpening: zoom in 400% and play with the sharpening slider(Sch�rfe). Look for the shadows, noise might be best visible there. 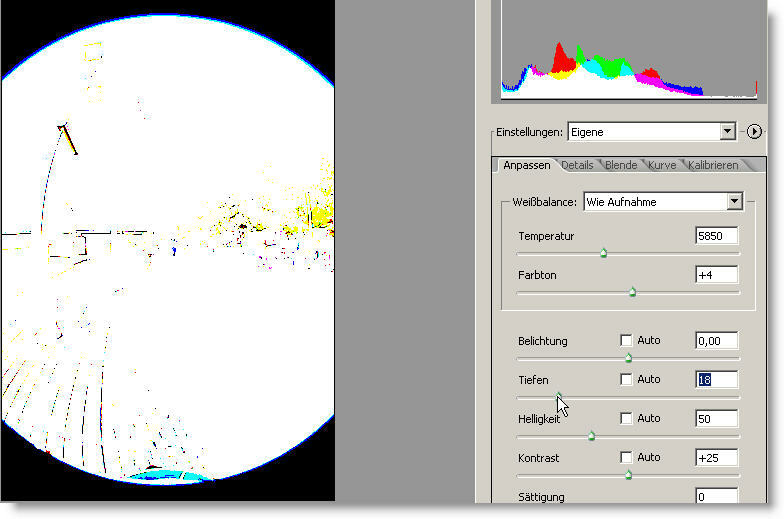 Go to the second slider Luminance Smoothing (Luminanzgl�ttung): This will reduce noise without in the luminance (brightness) channel. 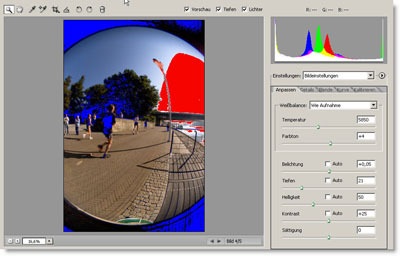 Color Noise Reduction (Farbst�rungsreduktion) will reduce the noise just in the color channels. 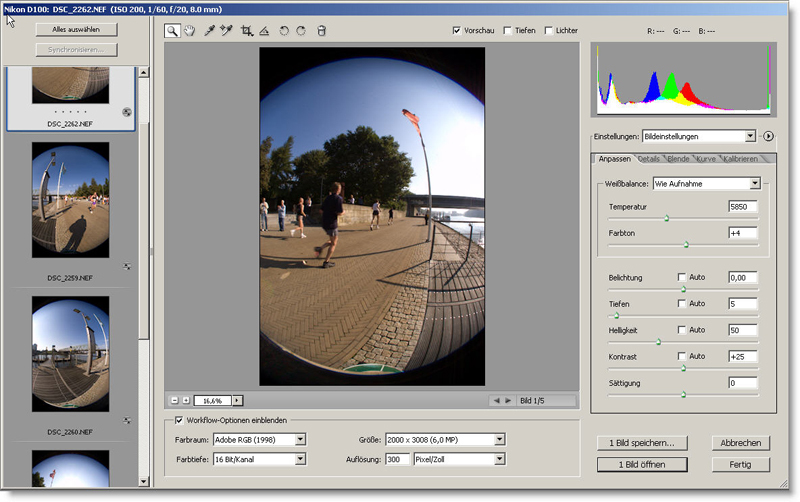 A very powerful tool is the vignetting control: Select all pictures on the left side and move the vignetting "Amount" slider until the picture looks right. Lastly, set the options for Space, Size, Depth and Resolution. Select the destination folder or create a new one. Modify the file naming scheme for the images to your need and select the required file format. See RAW dynamic range extraction for information on how to extract the full dynamic range from RAW files.